What will Virtuesse do for Me? 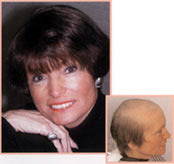 Thinning hair is not a problem any more and virtuésse is the only natural, fashionable solution. Women who have genetic or hormonal hair problems, or have lost hair through medical treatments, now don’t have to feel self-conscious about their looks.Now you can have real hair, lush hair, hair that’s perfectly matched to your own. Hair that styles any way you want it. Hair that’s uniquely yours. Virtual Reality is the champagne of hair replacement. 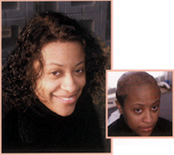 Beautiful, undetectable, easy to care for. And Virtuésse is the woman’s hair product you’ve been waiting for. Luxuriate in the naturalness, flow, texture and color you’ve imaged. Elsie Blevins of Advanced Hair Specialists is a trainer the in the art of Virtuésse, and understands the high-tech infusion science behind it, to perform the Virtuésse magic for you! You choose not only the hair and fashion you want, but the amount of hair that’s right, depending on your pattern of loss. Just what you need, where you need it. No medication. No surgery. Just a comfortable, quick and totally satisfying session to achieve your customized appearance. Give Elsie a call and experience virtual freedom today! Advanced Hair Specialists © 2019. All Rights Reserved.